Like many other hobbies, fly fishing can be expensive. With rods and reels costing upwards of $500, plus the added expense of waders, flies, line and a host of other odds and ends, it can easily cost $2000 before even getting a line wet. But, if you are looking to fly fish on a budget, there is still hope. Plenty of quality pieces of equipment can be had for a fraction of the cost while still providing many years of memory filled trips. Of course, it can be difficult to shift through the difference between “cheap” and reduced price. After all, it does not do any good to save money up front if you end up spending it down the road in repair or replacement costs. Let me help you by showing you a few of the best fly reels under 200, including my favorite, the Redington Behemoth. While many companies attempt to provide cost-weary anglers with price-friendly options by redesigning their more costly models, Redington does just the opposite. They design all their reels to be a quality cost efficient option from the beginning. With the Behemoth, you will get one of the most powerful drags in its class, adjustable carbon drag, large arbor for reduced line memory and increased retrieval speeds, and a lifetime warranty without wondering if it will work when the time comes. Add a unique die-cast construction, large ergonomic knobs & handles, easy to change deep V spools and even a free carry case, and you will wonder why it does not cost more! For these reasons, I have selected the Redington Behemoth as THE best fly reel for under $200. 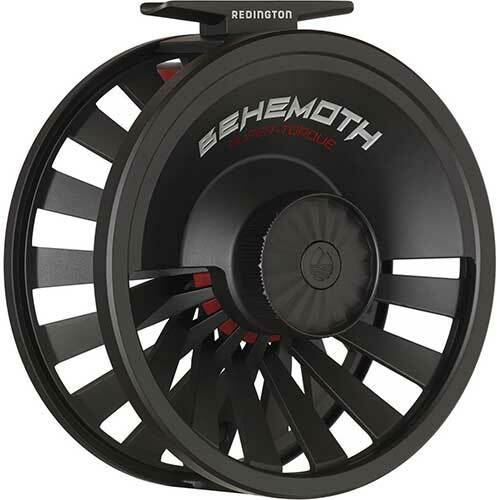 Check out more info of the Redington Behemoth fly reel here. Orvis is known for high-quality fly fishing gear, but that quality comes at a price which can often push $500. However, the designers at Orvis must have once been on a budget as well. They continue to offer a broad range of lower priced but reliable equipment for the angler who is equally concerned with the bottom line as they are a tight line. The Access Mid Arbor is a perfect example. Available in sizes from 1-3 to 9-11, the Access Mid Arbor is able to meet all your fishing needs while providing the quality you expect. Sealed carbon fiber/stainless steel drag system and 6061 aircraft bar stock provides a stable platform. Meanwhile, the Mirage gold anodizing and gold, black or titanium color provides for an eye-catching finish that looks like it cost 2 or 3 times the actual cost. 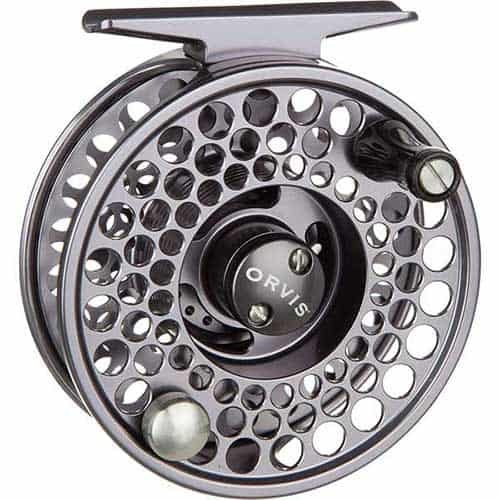 See more details of the Orvis Access Mid Arbor here. 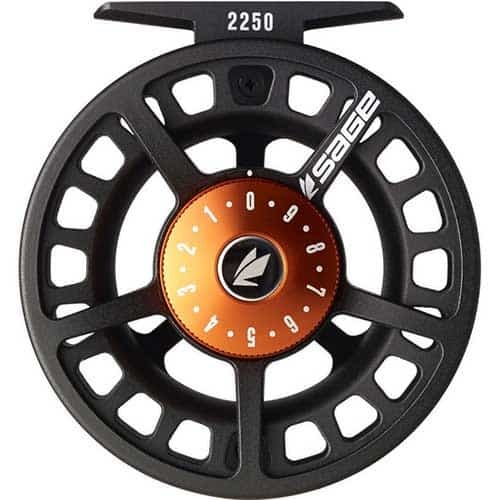 Sage is another of the companies known for top notch fly reel. However, they, too, produce some collector quality products with price tags that are not their primary focus. Sage recognizes their largest customer base consists of those who simply want a reel which will hold up and stop fish without requiring a second mortgage to do so. The 2200 Series is just such a reel. Often referred to as “budget-friendly”, the 2200 series is based on the more expensive 4200 design. Although cheaper than the 4200 series, this reel still includes many of the features anglers have come to expect - including a sealed carbon drag system, numbered drag knob and a sleek black finish. Furthermore, the savings is the result of d﻿﻿ie-casting rather than more expensive precision machined components. While this does result in a slightly heavier unit which is less durable than machined models, the difference is negligible and generally unnoticed outside extreme angling situations. More details and price of the Sage 2200 Series here. Freshwater anglers looking for high-end design and quality in a lightweight reel which will not break the bank need look no further than the Tyro 350 by Cheeky. Combining both die-cast and CNC machining, Cheeky has provided reel which measures only 3.5” and weighs a lean 5.3 oz. It also includes such features as B2 channelling, quick change spools, a carbon drag system and easy left/right conversion. Add the black & gold finish, and you get a sleek design which far outperforms its budget cost. If you are looking to tackle trout, bass or small salmon, then the Tyro 350 is a must in your tackle box. 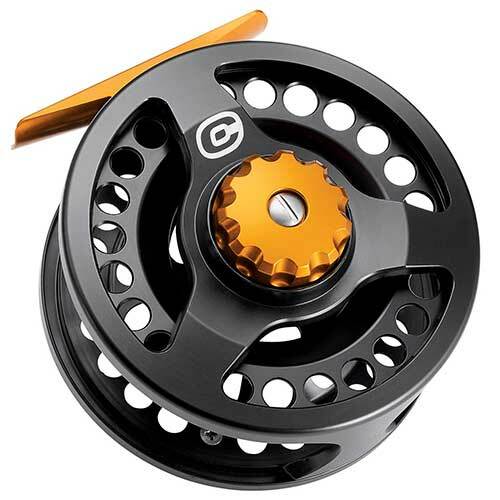 Other information of the Cheeky Tyro 350 Fly Reel here. The Guru 1 is the perfect way to own the performance and aesthetics of a high-end reel at only a fraction of the cost. The Guru 1 shares some features with some of Lamson’s more expensive designs. This includes a true large arbor, sealed & maintenance-free drag, easy to change spool and a lifetime warranty to the original owner. If you are looking for a saltwater reel, even for smaller species such as bonefish, the Guru will work but may not be the best choice. But although the wide spool, less than normal handle and medium retrieval rate makes for passable but somewhat lacking saltwater adventures, it suits freshwater species just fine. For the freshwater fly fisherman looking for a quality reel without a bank-breaking price tag, the Guru is one of the best performing models for the money. Plus, it is made in America. 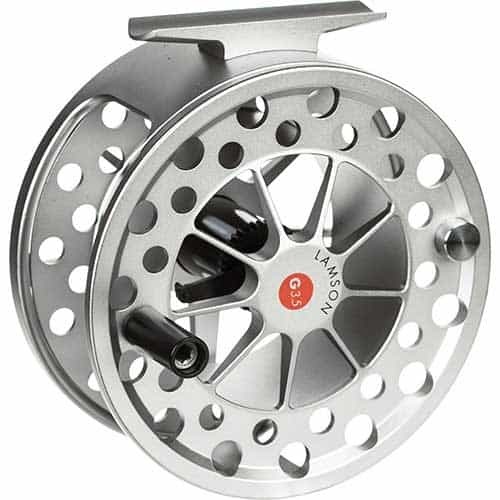 See the Waterworks Lamson Guru 1 fly fishing reel here. 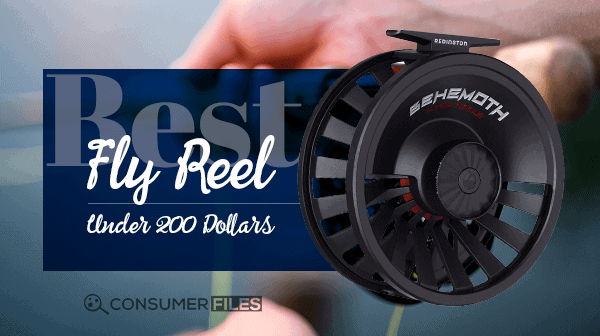 Whether you are looking for a reel designed from the drawing board to the stream to provide quality and performance without a hefty price tag, or a pared down version of one of the high-end manufacturer’s tried and true classics. The best fly reel under 200 dollars is listed here. Any of these reels will provide hours of fish fighting action and do so, season after season. However, because it is designed to be a reduced cost reel and relies on reduced production costs rather than reduced features to achieve this end goal, the Redington Behemoth is my first choice for the best fly fishing reels under $200. Of course, you should not take my word for it. You should pick up your favorite and take it for a field test of your own. See if you do not agree that quality and performance does not have to come with a price tag that will make you sweat! Good luck, good fishing! Check out the Redington Behemoth fly fishing reel here. Sage Fly Fish, Official Brand Website. Cheeky Fishing, Official Brand Website. F﻿ly Fishing Discussion Forums, Troutnut. Fly Reels, The Fly Fishing Forum.